History buffs visiting Lake Charles will appreciate the efforts of the Calcasieu Historical Preservation Society. Three years ago, this group initiated the Lost Landmarks project. 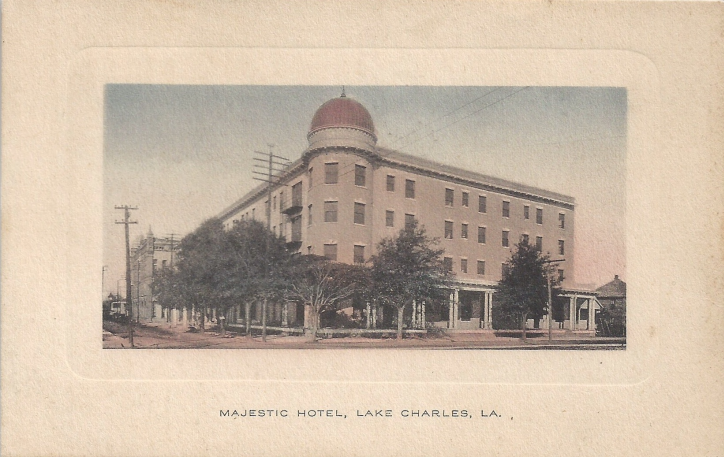 The program strives to preserve the history of significant buildings, once a vital part of the Lake Charles community, that no longer exist. The Society has thus far erected markers at nine of these historical sites. The historic marker for the original LaGrange School is located near Coyote Blues Restaurant in the 3600 block of Ryan. In 1903, Mesard LaGrange donated an acre for a one-room schoolhouse. A decade later, he donated nine more acres to expand the school. 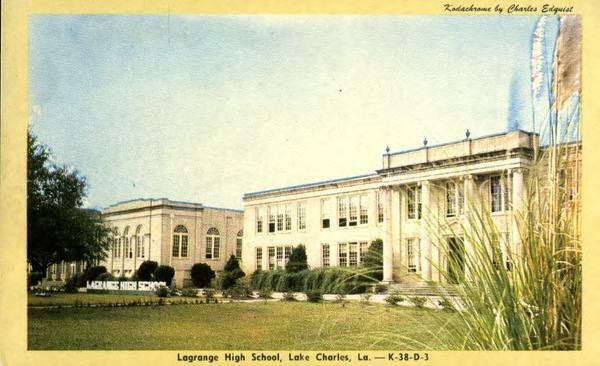 The new facility opened in 1929 and served the children of all grades in Calcasieu Parish until 1954, when a new LaGrange High School was built on Louisiana Ave. After that, the Ryan St. location served as the Junior High School until 1983, when it was labeled outdated and demolished. Opened in 1906, the grand Majestic Hotel welcomed guests on the corner of Pujo and Bilbo Sts. The hotel (and several surrounding buildings) survived the Fire of 1910 due to its own water system. Celebrities such as Harry Houdini, General and Mrs. Eisenhower, and Jackie and John Kennedy are known to have stayed at the hotel. For decades, the structure was the center of social, political, and cultural life for Southwest Louisiana. Sadly, the hotel was deemed obsolete and was razed for the construction of a parking lot that welcomes cars to this day. Cue Joni Mitchell. Ball’s Auditorium was a haven for what was known at the time as the Chitlin Circuit. Legendary musicians such as Ray Charles, Fats Domino, Tina Turner, and the Temptations performed there. A Lost Landmarks sign on St. John St. in North Lake Charles designates the location of this historical treasure. 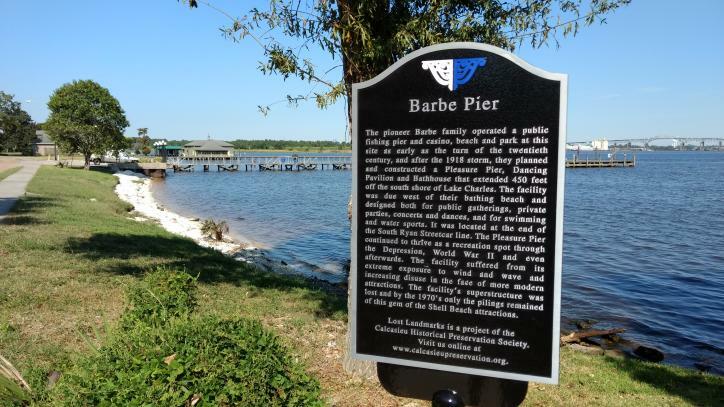 The Barbe family owned Barbe Pier, a public fishing pier, casino, beach, and park in the early 1900s. A category 3 hurricane in 1918 (storms weren’t named until 1953) destroyed most of their efforts, but they re-grouped and built Pleasure Pier, a dance pavilion, and bathhouse west of the beach. Natural elements and a general lack of interest eventually brought about the demise of this once thriving business at the end of the South Ryan Streetcar Line. The original St. Charles Academy, a boarding school for girls, stood at the northeast corner of Ryan and Kirby Sts., but was destroyed in the Fire of 1910. 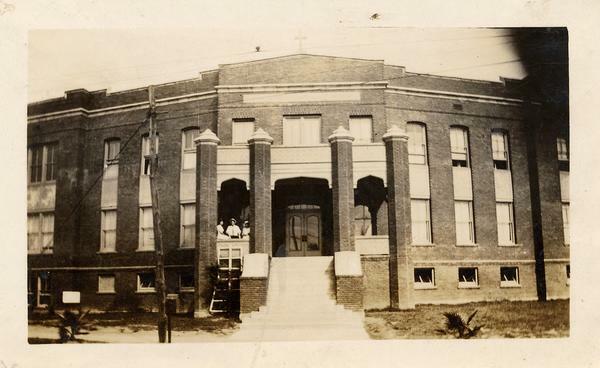 A new building was constructed in 1913 at the present day location of Immaculate Conception Catholic School, at the corner of Ryan and Michael DeBakey Dr. In 1970, St. Charles Academy, Landry Memorial High, and Sacred Heart High merged to form St. Louis High School. For a few years after, St. Charles served as a convent, and was demolished in 1974. 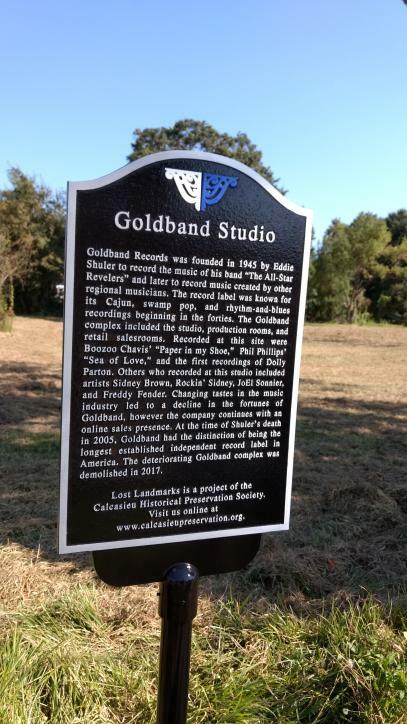 Eddie Shuler opened Gold Band Records in 1945 for the purpose of recording songs by his band, the All-Star Revelers, and other regional musicians. The studio, which had been located at the corner of Ryan and Church Sts., is one of the Lake Area’s most significant musical claims to fame. It’s where Swamp Pop originated and Dolly Parton recorded her first record. Freddie Fender, Mickey Gilley, and other big names also got their start at Goldband. Phil Philip’s hit “Sea of Love” was recorded there. Shuler died in 2005, at which time Goldband was the longest established independent record label in America. The building was no longer used, fell into disrepair, and was demolished in 2017. Rail transportation flourished for decades in the Lake Area and lines once crisscrossed the region. At least four Lake Charles railroad stations no longer exist. A marker describing the various stations can be found on Clarence St. near Ryan. This site was once home to the Iron Mountain-Missouri Pacific Railroad Station. The station was demolished in 1989. The marker also includes details for stations of the Southern Pacific, Union, and Kansas City Southern depots. 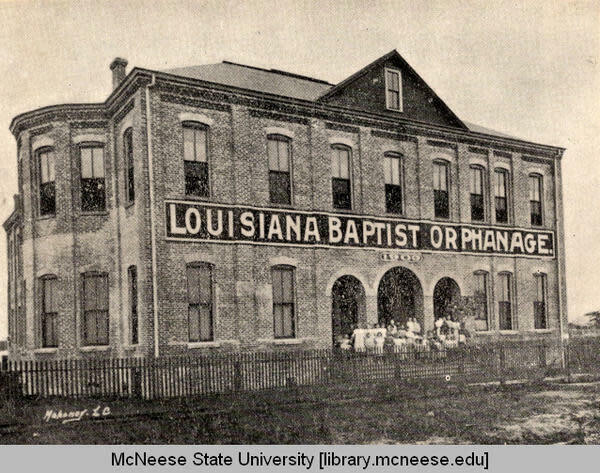 Louisiana State Baptist Orphanage, at Seventh and Banks Sts., once occupied the site of present day St. Louis Catholic High School. It was built in 1899, could accommodate 150 children, and operated until 1925. Mrs. J. A. Landry purchased the property and donated it to the Christian Brothers who opened Landry Memorial High, a Catholic school for boys, in 1927. A marker near the courtyard of the Historic Calcasieu Marine Bank at Ryan and Pujo Sts. designates several historically significant buildings. The six-story Weber Building housed offices for several businesses. The Miller Building offered office space and shopping. 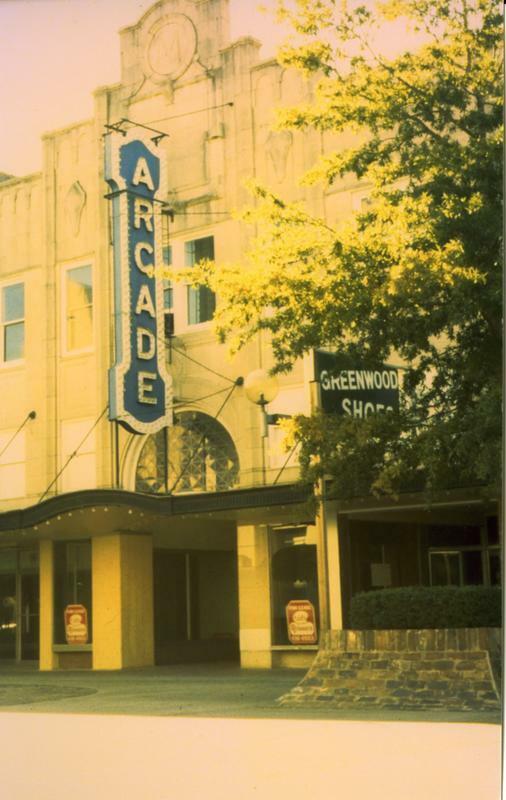 Citizens flocked to the Arcade Theatre for concerts, plays, and vaudeville shows. The Barrymores, in addition to many other big names, performed at the Arcade. 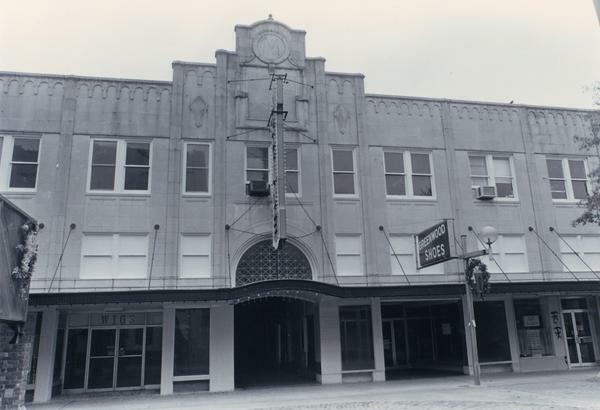 North of the Miller Building was the Paramount Theater, which was the grandest of over 20 movie theaters in Lake Charles, now all demolished. In 1978, these four structures were placed on the National Register, but were all destroyed in a fire in 1985. For more information, see http://www.calcasieupreservation.com.